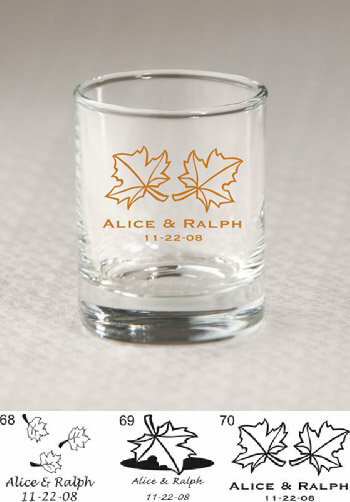 Your friends will love our personalized fall shot glass favors. These unique favors are fun for everyone and can be used for years to come. The 3 oz clear shot glass measures 2.5" tall and 2.125" in diameter, plus the glass can be customized to include your choice of theme, color and message. You can choose from our wide variety of fall designs or design something yourself. A wonderful keepsake that guests can use as a shot glass or votive candle holder, your family and friends will treasure the personalized fall shot glass favors. I ordered these votive/shot glasses as a gift favor for my wedding, I received my order in just a few weeks after placing it online! They were packed very neatly and carefully, I was worried that some would be broken since they are glass, but they were packed very well! I'm very satisfied with my order and the timing I received it after ordering!! They were exactly as shown online. I would buy from this company again. Very easy to work with. These shot glasses/votive holders are very nice. Better quality than I had expected. I have seen others where there is a sticker instead of printing, these are very nice and heavy duty.